I attended my first Highland Games in Springield, Illinois around 1997. There I came into contact with dozens of men in kilts, and bagpipers galore! In 1999 my wife and I became the grandparents of a wee lad. He soon made it apparent that he wouldn't go to sleep easily... unless there was bagpipe music playing in the house. Donovan made his debut in his first kilt at the age of one. 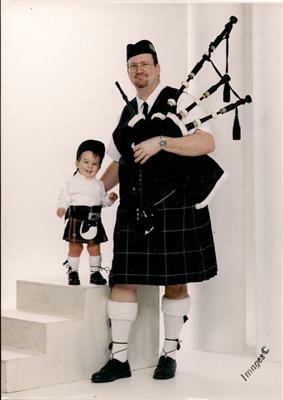 At 18 month Donovan and I had our photos taken together in kilt. Since then it has been a family tradition for the Gaydosh brood to proudly represent Clan Forbes at our Highland Games. Due to a broken leg in 2001, my piping days took a 9 year hiatus which a few weeks back finally came to a conclusion and piping lessons resumed. I have been known to wear the kilt to work for Tartan Day, to the Games and other Society functions, and I proudly gave my daughter away in a grand Celtic wedding. With an luck, I will be able to add 2 more kilts to my wardrobe. The Pride of Scotland, for the Pipes & Drums of St. Andrews Society of Central Illinois, and the Leatherneck Tartan for functions celebrating my 4 years in the United States Marine Corps. Included is a photo of Donovan & I in our kilts. I have a photo of Donovan at 1 year old in kilt, but there was only one slot for a photo!